Week 37: Jake and the Neverland Pirates. Yo Ho! Let’s Go! If you have never seen the Jake and the Neverland Pirates cartoon, it’s pretty good. My kids are really into pirates right now and they love this show. It is on the Disney channel. The show is loosely based on Peter Pan and also stars Captain Hook and Smee. This is one lunch my daughter has been begging for. Since this is one of the last lunch opportunities of the school year (I have one more coming next week!) I decided to finally tackle this one. This was made in an Easy Lunch Boxes container. If your kids like Jake, then try out this lunch, but only use your pixie dust in an emergency! 1. Cut a slice of bread in the shape of Jake’s face as shown. Don’t worry about his hair yet, just cut up to the bandanna. Repeat with a second slice. Put whatever you want in between to make a sandwich. Place sandwich in your container. 2. Cut spiky hair out of the large scraps of bread. Spread cream cheese on the hair and cover with raisins. Put his hair on top of his head. Slice a piece of apple in the shape of the bandanna. Slice a second piece that is shaped like the tails of the bandanna on the side of his head. Place on head as shown. 3. Put two small blobs of cream cheese on for his eyes and a tiny amount for his mouth. Draw on facial features using black food coloring (equal parts red, yellow, and green) and a toothpick. Finish by making Jake’s eyes green. 4. Spread your child’s favorite fruit or veggies around the face as a background. I used blueberries. 5. In one side dish arrange sliced strawberries. 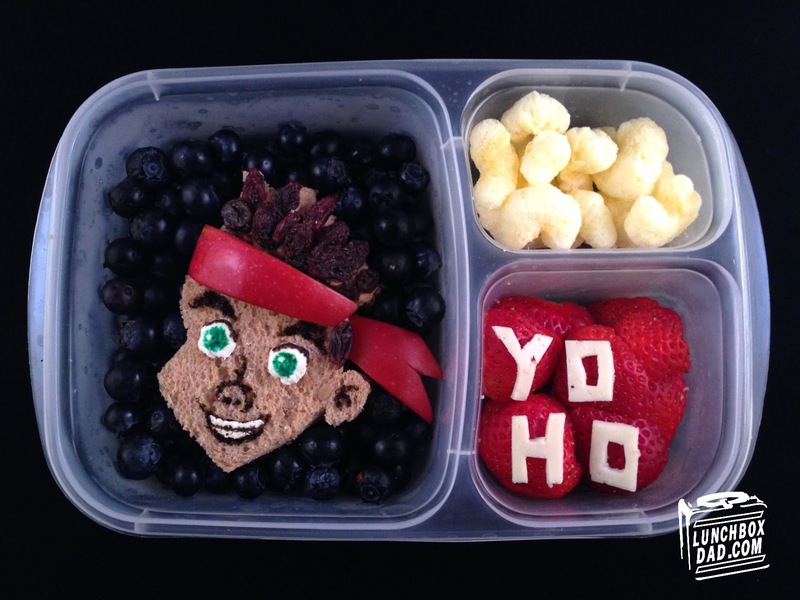 Cut out the words “Yo Ho” out of white cheese using a sharp knife. Place cheese letters on top of strawberries. Put Pirate’s Booty puffs as another side dish. Have a great last week of school and stay tuned for a new summer project happening on lunchboxdad.com to make your family day trip meals super easy and fun! “Lunchbox Dad’s Simple Summer” is coming soon. Please spread the word and remember to follow me on Facebook, Twitter, Pinterest, Instagram and any other social media link I have on the right of this page.